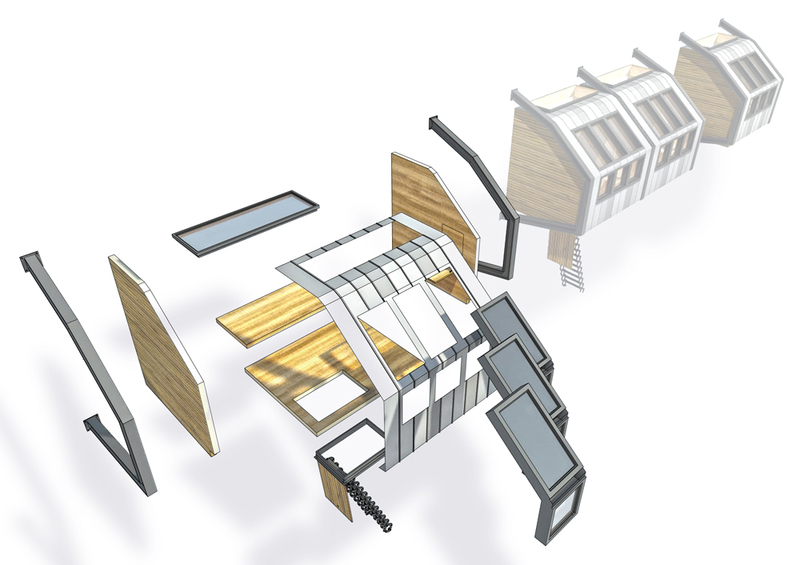 Architectural designer James Furzer has developed a modular homeless shelter that would hang off the sides of existing buildings, and launched a campaign on crowdfunding platform Indiegogo to finance a prototype. 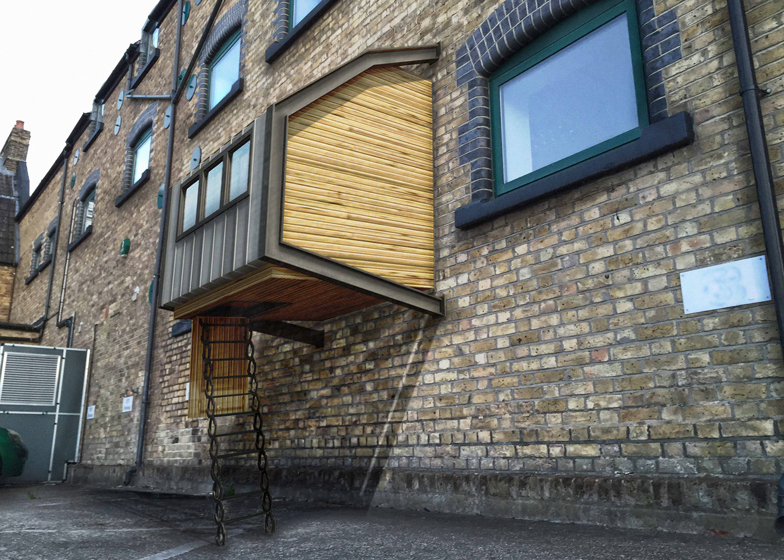 The lightweight pods, each featuring a timber sleeping platform and fold-down seating, would be affixed to the external walls of existing buildings in the UK capital to create a series of overnight refuges. Furzer is asking members of the public to make donations via a page on the crowdfunding platform Indiegogo to help raise the £15,000 required to prototype the design. 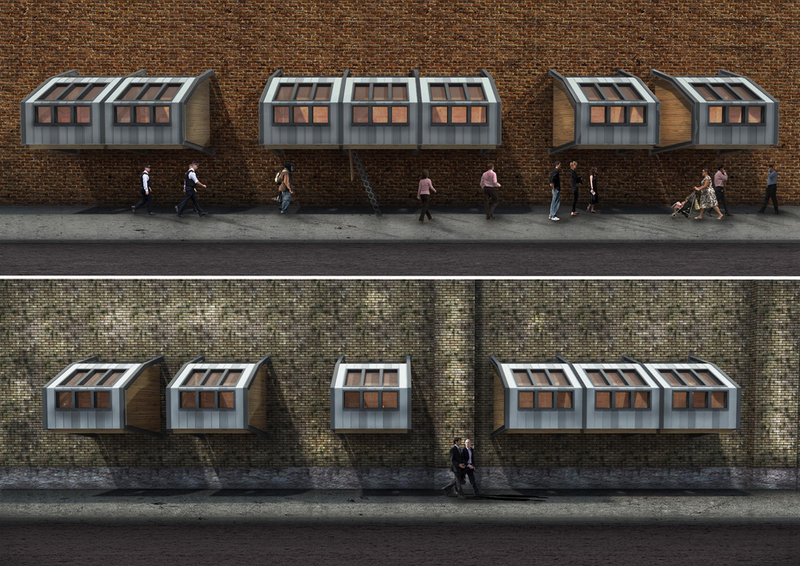 "The proposal is to create lightweight modular parasitic sleeping pods that can be attached to the side of any host building or structure, allowing a safe haven for the homeless during a night's rest, sheltered from the harsh and unpredictable weather conditions of Britain," explained Furzer. "Two thirds of rough sleepers say they have been insulted by a member of the public, and one in ten say they have been urinated on," he added. "Homeless people are 13 times more likely to be a victim of violent crime than the general public, and are 47 times more likely to be a victim of theft." The steel-framed pods could be made from scrap materials to reduce production costs, and adapted to match the colouring of their host buildings. They would be elevated above the street and affixed to a wall by a pair of metal brackets. Ladders would provide access, and could be stored away when not in use to prevent obstacles at street level. Furzer believes the project could spark a change in perception to homelessness, and reduce the use of deterrent design such as metal studs installed in front of commercial properties. "The rough sleepers of London need somewhere safe to sleep for an evening," he said. "If actual rooms cannot be provided, then I feel a safe sheltered area needs to be supplied." "The introduction of metal spikes across the streets of London acting as a deterrent to homeless in their regular sleeping or resting areas I find disgusting and inhumane. If this concept can encourage a shift in the mindset of the public towards the homeless, then I believe the project is a success." The temporary shelters would be managed by homeless charities, who would draw up booking schedules, usage terms and carry out maintenance to the structures. Furzer's crowdfunding campaign launched today and will run for 60 days. He is one of many architects and designers who have recently turned to websites such as Kickstarter and Indiegogo to finance projects. BIG recently launched a Kickstarter campaign to fund its smoke-ring-blowing power plant in Copenhagen, while New York designer James Ramsey is requesting public contributions towards an underground park called the Lowline. Visualisations are by James Furzer.